Halo Power Track Collection Low-voltage gimbal ring lampholder in matte black color, features die formed gimbal ring with polycarbonate casing. 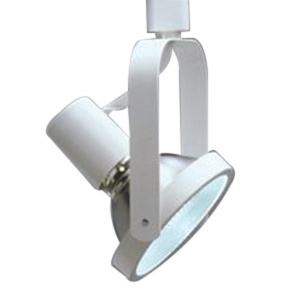 Gimbal ring of this lampholder incorporates lamp regress for optimum lamp position, thereby offering brilliant and uniform appearance between lamp types. It is perfect for use in accent and dramatic display applications. Lampholder accommodates 250-Watt PAR38 lamp. The 10-1/4-Inch extension lamp holder has head size of 5-Inch Dia x 6-Inch. It has deep drawn steel socket housing with matching finish. Front loading of the lamp facilitates for quick and easy relamping. Matching finish yoke facilitates this lampholder to rotate 338-degree and allows to adjust vertically from +/-90-degree. It is well suitable for use with Halo Linea and Lazer track systems. Lampholder is UL listed and CSA certified.